We are pleased to debut our new series, the Exeter Historical Society's History Minute. Okay, it's a little longer than a minute -- maybe even two. But you get the idea. In this series, we hope to present a tidbit of the history of Exeter, New Hampshire, using our vast collection of documents, artifacts and photographs pertaining to the town. This one is brought to you by the generosity of Commonwealth Dynamics, Inc. Check it out right here! 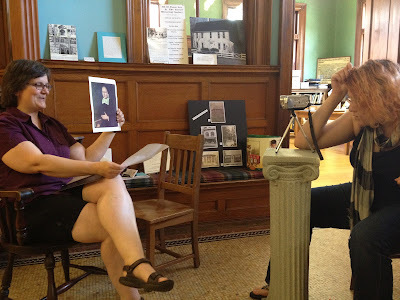 Filming the Exeter Historical Society's first "History Minute".